The Spyderco collectors club is an offer to collectors of Spyderco knives. The collectors club gives you the possibility to receive all Spyderco knives made, with your number on them. There is of today 200 available numbers opposed to before 1997 when only 100 numbers were available. The numbers before 2000 were engraved the traditional way, sometime in 2001 that changed to laser engraving. The Variant- designator is believed to have been added when the club was increased from 100 to 200 numbers in 1997. The Collector chooses a number from the list of open ones and then choose from the possibilities below. 1. All variants- The collector receives one of every variation of knife made by Spyderco. In practical terms this means that if Spyderco makes a knife with 2 types of handle and both types of handle in 3 different edges, the collector will receive 6 knives. 2. Main models only- The collector receives new SKU's only, and the model of that SKU that Spyderco decides is the main model. Continuing with the picture above, the Main collectors would only get the Black SE model of the C106 as that was the main model. The Mule- team knives had the MT01 (See MT Mule Team for details) in 52100- steel as the Main, and then all collectors got to choose wheter to receive all the others. The others will then be marked with the collectornumber and a V for Variant. The C92 Kopa had the Black Micarta C92BMP as main and all collectors got to chose if they wanted that single one or all variants. Collectors knives will be numbered with a collector number 059 for instance, and then the variants will have a 059V if the collector chooses to receive all variants (as in the picture above). 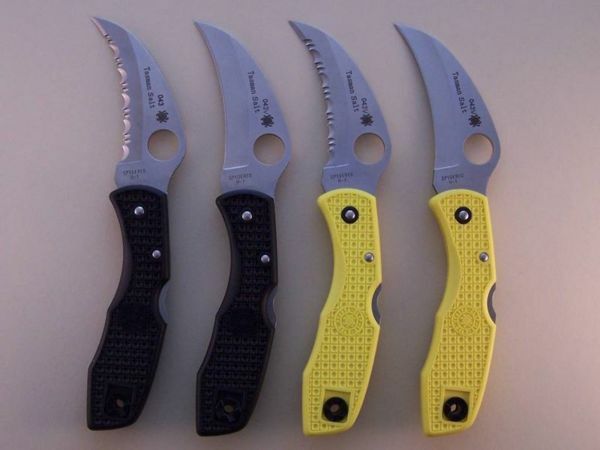 When Spyderco released the Hossom series of Fixed blades, the FB16 Jerry Hossom Forester was the main, and the remainding three knives in the series, although they had different SKU's, where considered variants due to the fact that they only differed in size. The C120 Mariner Salt was a Variant in the collector program even if it had a new SKU. This was because it was a reissue of an older model, namely the C02 Mariner. In 2009, the Spyderco Collectors Club was updated. Additional details can be found in this thread on the Spyderco forums. A new model number: C101, C102, etc. A design sequence number: Manix2, Delica4, etc. This page was last modified on 29 April 2015, at 08:10.